BART, a photo by Let It Be Raw on Flickr. 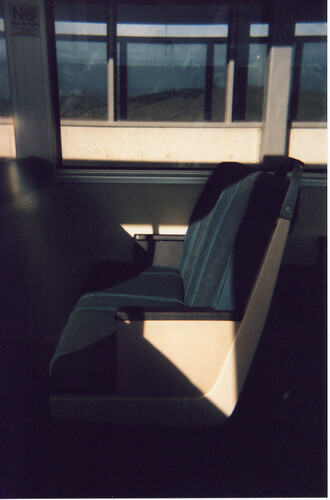 I used to take BART everywhere in the bay area. This was taken on a quiet morning with a point and shoot camera I bought for 1$. I still have that camera and use it rarely (so rare that the roll of film I last used in it was expired). It is a great little camera to carry around when you want to take a photo quickly and discreetly in a well lit area. It is also a great camera to experiment with if you want to play around with sun flares, shadows or test light situations because it is using a quick shutter speed (probably 1/500 of a second) that would probably not be used if a manual camera was in it's place. That being said, the little 1$ camera reminds me to use shutter speeds I wouldn't normally in certain lighting situations and to never stop experimenting.